Pseudoexfoliation syndrome and Pseudoexfoliation glaucoma consist of flake like microscopic materials which accumulate in the drain of the eye and drive up pressures damaging the optic nerve and many other eye structures. Read further to learn how this condition can be one of the more serious and aggressive forms of glaucoma - but yet perhaps the first to be cured. When averaged across the globe, it is the most common identifiable cause of glaucoma worldwide, and in some countries accounts for the majority of glaucoma. It leads to both open angle glaucoma and angle-closure glaucoma, and has been causatively associated with cataract, lens dislocation, and central retinal vein occlusion. Eyes with XFS have a greater frequency of complications at the time of cataract extraction, such as zonular dialysis, capsular rupture, and vitreous loss. Based on the identification of accumulations in orbital tissues, skin specimens, and visceral organs, XFS appears to be a generalized disorder of the extracellular matrix. The potential ramifications of this disorder appear to be far more important than ever before realized. Two reviews of XFS have appeared in the past year. PEX can usually be identified on examination using the slit-lamp. On biomicroscopy, a usually recognizable sign is white, flaky material at the pupil border of the iris and/or on the anterior surface of the lens. The lens usually displays a three ring feature on the anterior lens capsule. There is a central zone of visible exfoliation material combined with a middle clear zone and a cloudy ring at the periphery. The central exfoliative zone is thought to result from the back of the iris rubbing against the lens capsule and liberating it’s exfoliation material. This can result in a loss of iris pigment which can be evidenced by transillumination defects. The pigment granules can also be seen accumulating in the trabecular meshwork via gonioscopy, and the deposition has a distinctive pattern. The peripheral cloudy ring of the lens is usually only visible upon dilation. However, dilation needs to be done with caution because a percentage of XFG patients can have associated narrow angles which can potentially create a risk of angle closure on dilation. There is also the common feature of a unilateral occurrence with XFS or XFG, and pressures can become higher than normally seen in POAG. This higher IOP can result in more rapid nerve damage and visual loss than seen in normal POAG. The other unaffected eye must be watched closely as progression to both eyes eventually occurs in 40% of cases. Another feature which may occur in XFG is poor pupillary response to dilation. This is believed to result from iris dilator muscle atrophy. Cataracts are common with XFG and their removal can be problematic because of the aforementioned problem and also because of weak zonular attachments resulting from the disease. Finally, another feature of XFG is usually the finding of thinner central corneas (CCTs). In come cases, XFG does not respond favorably to glaucoma medications for lowering IOP. Nevertheless, they are still often used as a first line of treatment. These medications include beta blockers, selective alpha2-receptor agonists, topical and systemic carbonic anhydrase inhibitors, prostaglandin agonists and sympathomimetics. A second line of treatment involves the use of SLT or Selective Laser Trabeculoplasty link. SLT is often effective in XFG and usually gives good pressure lowering results because of the heavier pigmentation in the trabecula. However, this treatment may need to be redone because the effects are usually not permanent. In his correspondence with the Fiteye’s discussion group, Dr. Ritch mentions the usefulness of mitotic drops like pilocarpine in the pressure control of XFG in his patients. Pilocarpine has multiple beneficial actions in eyes with XFS. Not only does it lower IOP, but by increasing aqueous outflow, it should enable the trabecular meshwork to clear more rapidly, and by limiting pupillary movement, should slow the progression of the disease. Theoretically, miotics should be the first line of treatment. Pilocarpine 2% q.h.s. can provide sufficient limitation of pupillary mobility without causing these side effects. Finally, filtration is an option in certain cases of XFG. PEX is a type of stress induced elastosis associated with the excessive production and abnormal cross linking of elastic microfibrils accumulating in intra and extraocular tissues. Pro-fibrotic growth such as transforming growth factor (TGF)-ß1 and their tissue inhibitors (TIMPs) appear to contribute to the progressive accumulation of PEX material. Several environmental conditions associated with PEX and other fibrotic disorders, including oxidative stress, hypoxia, and elevated levels of pro-fibrotic cytokines (interleukin-6) and growth factors (TGF-ß1), have been shown to regulate both LOXL1 and clusterin expression as well as synthesis of matrix molecules including elastin and fibrillin-1 in vitro (Zenkel et al., ARVO Meeting 2009, Abstract) and may therefore act as co-modulating external factors. PEX syndrome is generally considered as a complex, multi factorial, late-onset disease involving a combination of genetic and non-genetic factors in its etiopathogenesis. There is compelling evidence for LOXL1 as a strong genetic risk factor throughout all populations studied, although the causal variants still need to be characterized. Some have also proposed that PEX has characteristics of an immunological disease. It is well known that in rheumatoid arthritis (RA), a connective tissue disorder, a specific antinuclear antibody (ANA) which has specific activity against joint fluid is expressed, and is found in high concentrations in the serum. The authors of the present study sought to examine the serum and aqueous levels of ANA in both PEX and control eyes to determine whether increased ANA levels might be associated with PEX. 43 eyes with PEX were examined histochemically. Immunological studies were performed on 32 PEX eyes and on 23 control eyes, consisting of pre- and post-operative indirect immunofluorescent analysis of serum and aqueous ANA levels. Immunofluorescence was graded on a subjective scale ranging from 0 to 4. Histochemical analysis revealed that lens epithelium is one of the sources of PEX material. Conjunctiva and trabecular meshwork, in comparison, did not demonstrate PEX material, a negative result which may have resulted from the lack of EM studies. 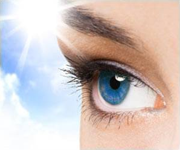 46.9% of eyes with PEX demonstrated ANA in the aqueous, compared to 8.7% of control eyes. This difference was significant (p < 0.0001). 34.4% of PEX eyes demonstrated ANA in the aqueous, but not in the preoperative serum. In contrast, none of the control eyes demonstrated ANA in the aqueous. This finding suggests that ANA may be abnormally produced and expressed in the anterior segment of eyes with PEX. See Is pseudoexfoliation an immunological disease? Pseudoexfoliation syndrome and glaucoma are fairly common, but they occur more in Nordic, Baltic, and Mediterranean populations where PEX can affect up to 30% of individuals over 60. Pseudoexfoliation also occurs in other ethnicities as well, including Mongolians and South African blacks. Other associated risk factors include living in high altitudes or northern latitudes when young, and being exposed to high amounts of UV light. Blacks are not affected as often as whites (except as noted, South African blacks). Even though some studies show a higher prevalence among women than men, other studies show occurrence is about equal. Unlike pigmentary glaucoma or syndrome, PEX (XFS), and XFG occur more often over the age of 50, with most cases being diagnosed in the 60’s or 70’s. Both pseudoexfoliation syndrome and pseudoexfoliation glaucoma represent challenging ocular diseases which also have potential systemic consequences. XFS and XFG both involve low grade inflammation and oxidative stress, and this represents a potential for adjunct treatment besides IOP lowering. There are a host of substances which can potentially help both the inflammation and oxidative stress components of this disease. This should also include a healthy diet for glaucoma. Dr. Ritch recommends Gingko Biloba Extract, Curcumin, and Resveratrol as potential substances having a beneficial effect. And of most importance in our view at FitEyes, is the relationship of psychological stress in these conditions. Dr. Ritch also maintains that though XFG is one of the most aggressive forms of glaucoma and presents numerous challenges, it is also possibly one of the first to see a cure due to advances in genetic therapies and stem cell research. Unlike other forms of glaucoma, at least there is an indication of the involvement of an identifiable entity - i.e., the characteristic exfoliative material.